The unseen world of science that some computer scientists have an advantage seeing the objective reality of Nature through the Matrix of Design. It must be noted that Information Science is at the very heart of the objective reality of Nature, the fabric of spacetime itself distinguishes information into discrete quantum packets of particles and components of energy at the smallest level of Plank time and length (Plank Spacetime). Existence would not exist without distinction of information, this from that, that from this, here from there, there from here, now from then, etc… in a (seemingly) never ending continuum and volume. In a very real way information science is more fundamental than even physics. Without information existence would not exist. Is it even possible to have existence without information? 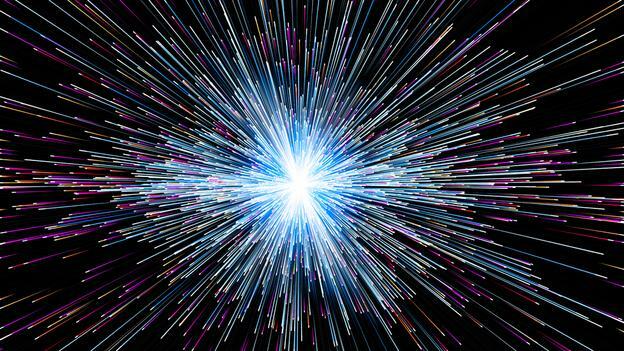 Only in a singularity of the pre-big bang instant when there is nothing, I’d assert. “There is a considerable difference between a mathematician’s view of the world and a computer scientist’s. 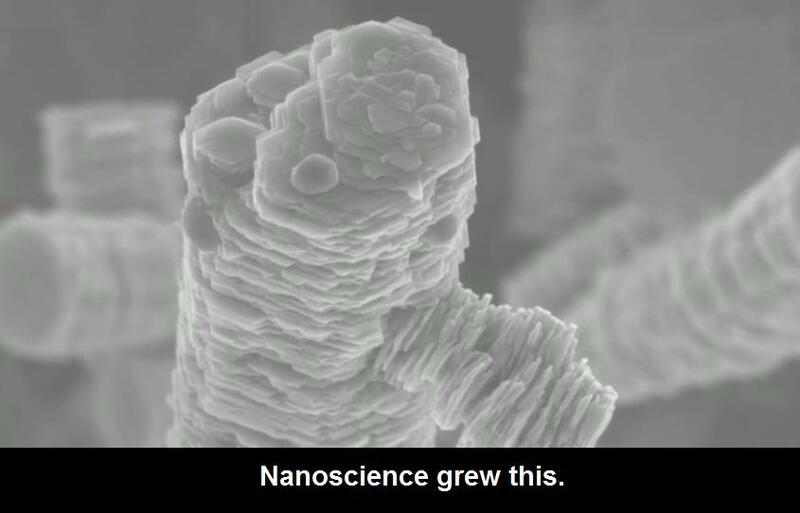 To a mathematician all structures are static: they have always been and will always be; the only time dependence is that we just have not discovered them all yet. The computer scientist is concerned with (and fascinated by) the continuous creation, combination, separation and destruction of structures: time is of the essence. 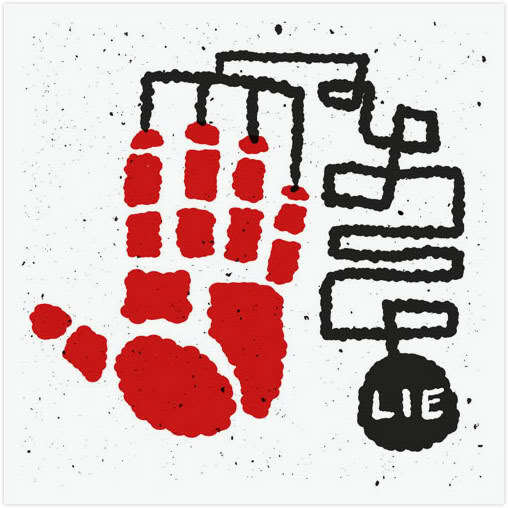 The legal right of the government to lie to the people has always bothered me as it smacks of a lack of integrity by the very people allegedly empowered to have the highest levels of integrity and honesty by the people. The members of the government, in whatever capacity or role they are filling, have a special trust to uphold and when they use deception why are they allowed to get away with it and yet a different standard is applied to the people when they lie? If a defendant in a court case lies at any point while being investigated it’s treated with such great importance that it’s as if the world came to an end… but when the cult members of the cult of government lie it’s for the benefit of the people and lifted up as somehow an honorable trick that was played to get at the truth when in fact it’s no different for it was a lie, a deception, a non-truth, falsified information, a fabrication designed to give false impressions. It’s ironic that some of the best liars are likely working within the government and get rewarded for it. 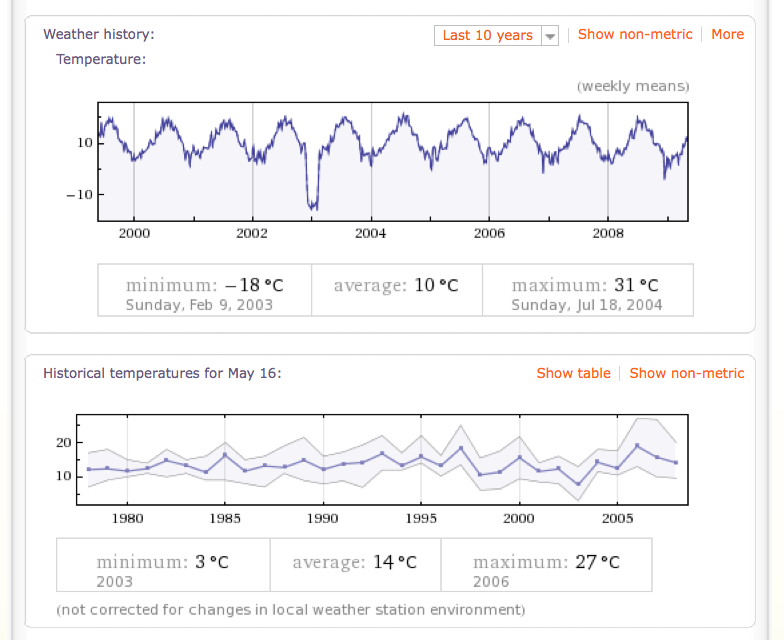 Wolfram Alpha compute “weather Vancouver”. Very interesting graphs and data. Try your city or a place you’re interested in. 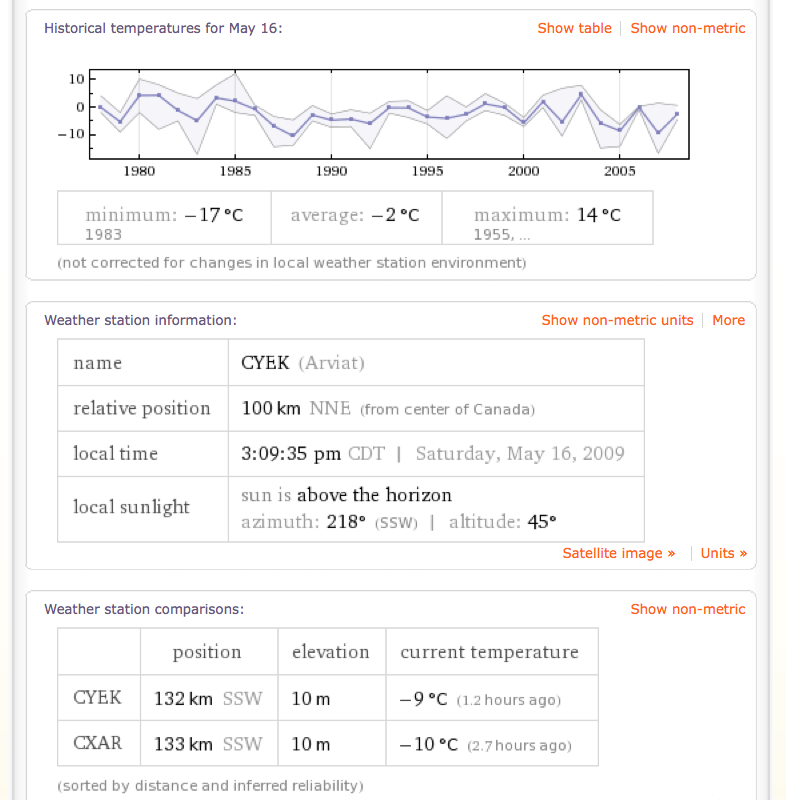 Plus Wolfram Alpha has Mathematica functionality built into it so you can use it to verify the computations of others. 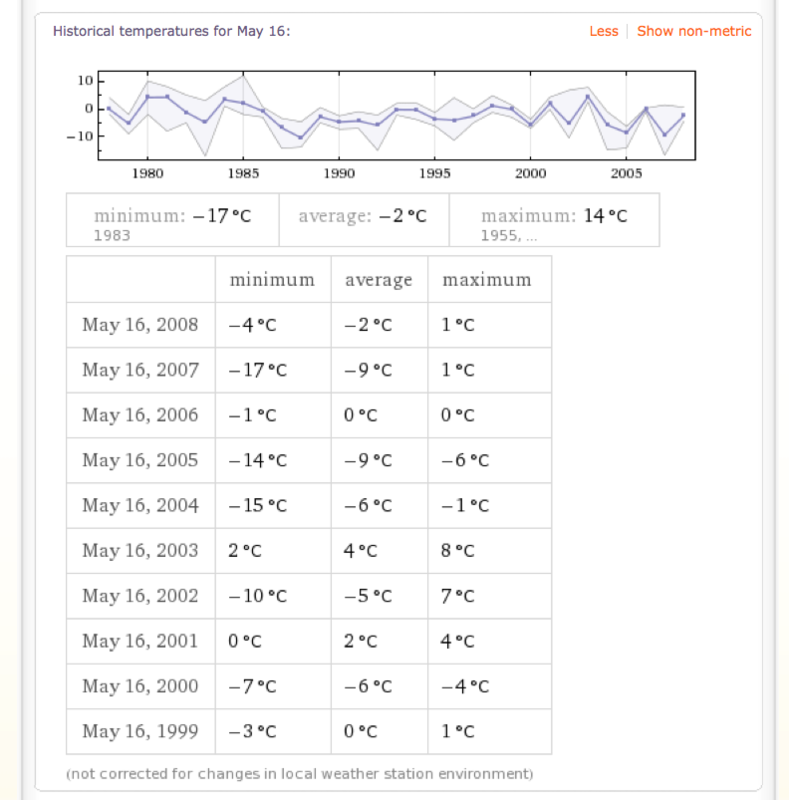 Using Wolfram Alpha to compute “weather Canada” produced the following interesting information. The Alpha Wolf uses a weather station near the center of the place you ask for. 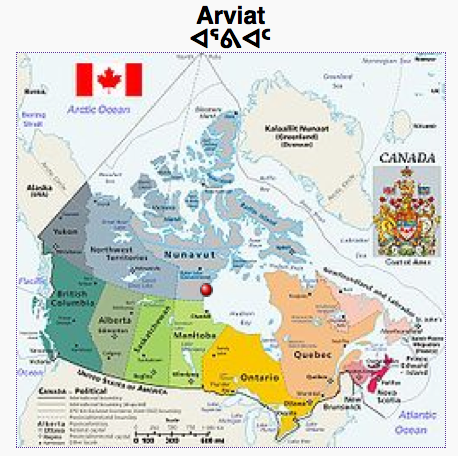 As a result it picked Arviat, Nunavut, Canada (red dot in map of Canada above) as the closest weather station to the center of Canada. Since Canada is huge and goes quite far up North this makes the center of Canada quite far up north. Darn, looking at that map it’s clear that Greenland should be part of Canada. Let’s start by taking Hans Island! Oh wait, that’s ours already. Onward to the mainland of Greenland! Oh, wait… nah… it’s just frozen Vikings there… Ok, Denmark you can keep Greenland but we get to keep Hans Island! Thanks. March 17, 2007 – Scientists from the University of Toronto and the Technical University of Denmark announced plans to install an automated weather station on the island, some time in the summer of 2007. July, 2007 – Canada updates satellite photos and recognizes international border as crossing through the middle of Hans Island, not to the east of the island as previously claimed. I wonder if the weather station was installed and if there are any data from Hans Island? Oh, it looks like the Hans Island Ice Flow observation and weather station might have been delivered now. Maybe that desolate place is useful after all. Danish and Canadian researchers are co-operating to establish a weather station on Hans Island, reports Ritzau. Even though Denmark and Canada do not agree about who owns the 1.3 sq km rocky island located in the Nares Strait between Greenland and Canada, scientists from the two countries say they co-operate and use the island for scientific purposes. For that reason, a weather station was shipped up to Hans Island last week, by Preben Gudmandsen, professor emeritus at the Technical University of Denmark. The weather station will initially be located at the base in Alert in northern Ellesmere Island. From there it will be flown by helicopter to Hans Island. Weather permitting, the station should be operable in May. Information from the weather station will offer researchers the data they need to work out a better weather model for the area and determine how ice from the Arctic Ocean is transported south through the Nares Strait. The ongoing fuss about Hans Island might be entering its last verse. The small, wind-blown island located between Greenland and Ellesmere Island in Canada which has given Danish and Canadian diplomats gray hair will most likely house a joint Danish-Canadian meteorological weather station. Work on the weather station is expected to begin at the start of the International Polar Year. If all goes according to plan, initial data will tick in starting next year. The joint effort has been organised by professor emeritus Preben Gudmandsen from the Technical University of Denmark (DTU) and Prof Kent Moore of the University of Toronto. The project is seeking the blessing of the Danish Foreign Ministry and will subsequently be sent for approval to the Canadian Foreign Ministry, writes Polarfronten. After the formal details have been worked out, it’s just a matter of digging in. DTU and the University of Toronto have agreed to split the work based on their individual abilities. In the real world, that means the Canadians will end up with the heavy loads with establishing and financing the technical aspect while the Danes are responsible for expertise and collecting data from the area. Both Gudmandsen, the University of Toronto and the Danish and Canadian foreign ministers are looking forward to the plans so the meteorological research station can provide more than answers to researchers’ questions. Still looking to see if the weather station went ahead or was stalled due to geo-arctic-politics. Anybody know? While Canada is absorbing islands into the fold let’s have Canada merge with the Turks and Caicos Islands to warm up our temperature average in Canada, which is what would statistically happen, right? Call it Canadian Warming or Warming of Canadians who visit the newest island of Canada. It’s also a sure way, and maybe the only way to truly claim that Canada’s Arctic is warming up – see the average for the whole country goes up when we add in a nice toasty island to the mix. Ah the wonders of lies, damned lies and statistics. Ah the wonders of curing a serious Vitamin-D deficiency on a warm sunny beach. You can get at the underlying data. Too bad it’s only ten years… Cooling trend? I suppose that depends on how many years and which years you’re looking at and how you compute the trend and how you “skew” the data in your favor, oh pardon me I meant to say how you “filter” the raw data which isn’t good enough for publication, oh, darn, drats, damned data is a mess. Let’s fix that the proper way shall we?